There is no better way to celebrate the joy of giving than by helping those in need. 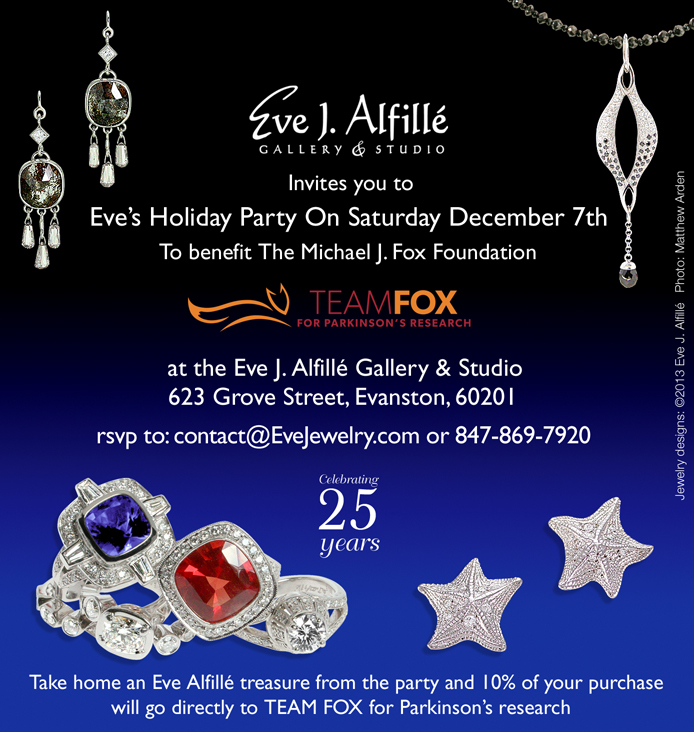 Eve J. Alfillé Gallery and Studio is contributing to the holiday spirit by putting unique fine art jewelry to use in the battle against Parkinson’s Disease. According to the Michael J. Fox Foundation for Parkinson’s Research, Parkinson’s Disease affects an estimated five million people worldwide. The neurological disorder affects the brain in a way that can impact movement, memory, and even mood, and an estimated 60,000 people will be diagnosed in the United States this year alone. The Michael J. Fox Foundation for Parkinson’s Research was founded to provide support for the study of Parkinson’s Disease, and has provided $375 million to the goal of finding a cure. On December 7th, Eve J. Alfillé Gallery and Studio will host a fundraiser from noon to 6pm to help benefit the foundation. Ten percent of sales from the fundraiser will go to the Michael J. Fox Foundation, and Make It Better magazine has partnered with the gallery to provide even more help for the research of Parkinson’s. Every subscription to Make It Better’s email newsletter at the fundraiser will generate five dollars for the Michael J. Fox Foundation. With the holidays so close, Eve’s Holiday Party provides beautifully crafted, unique gifts that will make a difference to the receiver and those affected by Parkinson’s Disease. In addition to refreshments, wine, and champagne, two jewelry pieces will be raffled – one, a piece of original Eve Alfillé jewelry, the other an art glass piece hand-designed by Eve’s daughter Diane Alfillé. And for those who can’t attend the Holiday Party, Eve J. Alfillé Gallery and Studio will be open the last two Sundays before Christmas from 1 – 5pm, allowing everyone the opportunity to get the perfect holiday gift for themselves or their loved ones.